We had our first significant snowfall yesterday after a rather long Indian Summer (is that still a PC term? Probably not.) It’s hard to believe that just two or three weeks ago it was a balmy 65 degrees and we were practically still wearing shorts, but not really. The weather people say that we’re going to have less snow than normal this winter in southwest Colorado. When we heard this, we were bummed because we just invested a lot of money in a used ATV with a snow plow AND some great cross country skiing equipment for me. We’re looking forward to exploring all that the Ridgway/Ouray/Telluride area has to offer in terms of Nordic skiing and snowshoeing. While it’s too early to say for sure, it appears that the weather is going to catch up with us. We had about 7 inches here from this last storm and appear to have another 7 forecasted for early next week. And we must really be in luck because in between the weekend looks clear and sunny. We had a couple of challenges with the chickens. First, a hawk had stalked and then attacked one of the hens last week. He didn’t get her, but the flock was pretty freaked out the rest of the day and the entire next day, pretty much just staying in their coop. Since we are not allowed by law to hunt down red-tailed hawks, I had to think of a cheap and fast deterrent. I heard that plastic owls will keep hawks away, but those cost too much money. My idea was to string nylon cord in a criss-cross pattern about 7 feet off the ground of the entire chicken enclosure. The thinking here is the hawk won’t want to negotiate between the string and will feel insecure about getting caught down in the yard. So that’s what we did. Plus, I also strung up strips of aluminum foil here and there to add reflection and further deter the hawk. The deterrent is working so far. It’s been a week and the hawk hasn’t returned. He may also have gotten scared by my screaming and yelling when I saw him perched on the post a week ago. Crazy woman lives here, he may have thought, not worth it. The other challenge has been the overnight temperatures, which have been getting down into the teens and last night dipped to ZERO degrees F.
Not that it made that much difference in the temperature, but I installed a very small electric heater inside their run, which I had previously wrapped in greenhouse plastic and surrounded with straw bales on three sides. I figure it at least kept their coop about 10 degrees instead of 0. Maybe I’m kidding myself and it didn’t make much difference. In any case, I was pleased to see that none of the chickens appear to have frostbite or any injury due to the cold the last couple of days. I bought a water fount heater a few weeks ago and have been using it, but it’s not inside their run, it’s near the fence, and the chickens just don’t want to be out and about when the wind is blowing and it’s snowing and cold. I put out a black rubber bowl of water inside their run, which does freeze up, but I can go out there and poke at it or add hot water a couple of times a day. Not ideal. I don’t know what the answer is except to shovel a path for them, lay down some straw and encourage them to walk over to the fount. They were doing that today since it’s been warmer and sunnier. The good news is that the hens are continuing to lay between 3-5 eggs per day, usually just 4, even though there are 7 of them now. (One died in Sept from unknown causes). No slow down in production yet. I’ve been giving them scratch and occasionally corn. What I love about this place this month: how beautiful the snow looks as it arrives, falls and settles. How bright everything is now when the sun shines. I love the “traffic jams” of cattle drives that are always unexpected and so far, still amusing. I love how three cows escaped from the ranchers near our house last month and have been wandering around free. Our new neighbors call them the Three Amigos. I think it’s hilarious how they are renegade cows. I love the wild turkeys. Today I discovered our area is in the flight path (and resting path) of sandhill cranes. I’ve seen them fly overhead and have heard them up on the Buttes, but I haven’t yet seen them up close. There’s a lot of reasons to love this place. We’re still finding new ones. With 8 chicks in the yard, life used to be so hard, .... yeah yeah you get it. I thought I would post some pics of the house! From there, into the main living area. This is taken from the top of the stairs that start from this living room. The shades are closed on those big east facing windows to keep the morning sun from heating up the house (remember, we don't have air conditioning!) The room is anchored by a truly massive glass-front wood stove, the biggest I could find. It makes our 42" TV look almost small next to it! The kitchen, like the living room, is a small space that somehow manages to be just enough to be comfortable, convenient and not cramped. The house lacks a pantry, so the big floor cabinet on the right serves that purpose. The white door on the left is the access to the basement level. (The house has an unfinished full basement, 1200 sq. feet, with 9 foot ceilings!) at the bottom right you can see the "heirloom" cherry sideboard I made years ago. It's got a nice spot in the dining room, where this photo is taken from. The loft also has room for "Roderick", our sleeper couch. A nice spot for reading a good book or looking out the north windows towards McKenzie Butte. The office is definitely still work in progress, but for now it houses the musical instruments, and the pictures snagged from Casa Daytona: Houserville park and the old Penn State main. At the back of the 2nd floor is the Master. Windows on the west and south keep it cheery, and at 14X13 it's big enough to feel like a master and have plenty of room for a couple dressers and bookcases, but still pretty cozy. A cathedral ceiling allows for a ceiling fan and a feeling of spaciousness. Don't do it, they said. Predators will go on a rampage, they advised. You don't know how to take care of them, they admonished. And hey. They may all be right. All snarkiness aside, we're into about week three of the Great Chicken Experiment. Margaret purchased four Buff Orpingtons (the tan ones) and four Black Stars (the dark ones), all hens. They're supposed to be good layers, and docile. Our favorite so far is a Black Star with a light brown head. She's amazing. Endlessly curious, always coming up to us. Following us around the yard on our daily list of jobs: gardens, mulching, edging, and on and on. She even has come up to Skillet to check her out. We call her Rock Star. So how are we keeping them safe? We have a nice cozy coop for them with a 9 foot fully enclosed yard. Egg boxes and door have good, heavy duty latches fr closing up at night. We decided to make this enclosure tough to get into by running hardware cloth along the ground, stapled to the enclosure frame and held down in place with heavy duty landscaping staples. It's all covered with mulch and straw, and should prevent diggers. I hope. The door opens during the day, and the chickens can free range in the yard . And see that weird thing on the fence, to the right of the coop, that looks like the seat and lid of a toilet bowl? Well, that's another crazy idea. It's a latched door I made out of plywood that allows entry into the space in between the inner and outer fences of the yard. This constitutes a 4' wide space along the entire perimeter, something like 250 feet so far! So these chickens got room to RUN, baby. So like I said, so far so good! The chickens are really comical and fun to watch, as we were warned. A good replacement for TV, is one is so inclined. So far their favorite treats are RED fruits, like berries. Yes, it's true, after all this time and effort, I sum it all up with lyrics to a Barry Manilow song. Let that be a lesson to y'all out there who take your lives too seriously! But the momentous day finally arrived June 1, 2016. Actually it was 1AM, so technically June 2nd. That's when I rolled up to the house with my dog and my truck and my wood shop in tow, withOUT the intention of returning to Broomfield. Here for good, and finally! Dead tired after moving and driving all day, I get out and stare up at the picture perfect Milky Way hanging in the whisper quiet sky over the house. But things are official now. And what better way to make things official than with a bottle of bubbly? Speaking of official, our official address is 2119 County Road 1A, Montrose CO. In classic Emerson/Olivero style, we pretty much had every box unpacked and totally moved in less than 48 hours after the moving truck arrived. Next project: Garden and chickens! I'm sure we all have images in our heads of what "country living" must be like. Let's face it, most of us live in cities or suburbs these days, far removed from places that are far removed. What's it like meeting the basic needs? Getting things done? Case in point: heating your new home. Certainly we could have sprung for a heat pump, radiant floor heating, or other such option, if we were willing to fork out the dough. Already overbudget as this place is, we opted for the standard, the cheap, way to go: Gas furnace, forced air heat. But this ain't no city street with a natural gas line conveniently at hand. Nope, us country folk use PROPANE. I have to say, the heat works wonderfully. Quiet furnace, heats the interior quickly and evenly, all very nice. On our most recent visit, we took a look at the propane tank - first, we had to re-shovel the short path to it from the driveway through the 2 feet of snow on the ground at the moment. When we check the gauge, we see that it's only at 30% full. Not good. Running out of propane in the middle of winter, in a house that's 300 miles away, well, it's not the best situation, is it? The next morning I call Pioneer Propane in Montrose, give them my name, ask them about the propane fill. They start with: "Yeah, we've been trying to get a hold of you." "We can't deliver to your house. The driveway needs to be plowed." "I see. But it IS plowed. I shoveled it myself. I had no problem getting back here. When was the last time you tried to deliver?" "He came by last week. He could't go in. It has to be wide enough for a truck." "Yeah, but I drive a truck. I drive a Tacoma. It's plenty wide for that." "No, that's not good enough. It has to be wide enough for a four wheeler. We've had a couple incidents of getting stuck in people's driveways, and we can't risk going back there." "But I need propane. I'm at 30%! What do I do?" "You need to plow it sir. When can you have it plowed?" Sigh. "It'll be done today. When can you come by?" "In the next couple days." Sometimes when I'm walking on the county road I look at the house and think "It's too close to the road, it should be further back." It's hard to describe. There's so MUCH space and nature up on this mesa, and neighbors are generally set back such that you basically can't see each other from your homes. So seeing my house, with its big picture windows and expansive deck, seems a little...immodest, almost. I dunno. But that was my thought BEFORE i started shoveling. I hung up the phone, and thought: well, guess I know what I'm doing today. I went outside and grabbed a shovel. Four and a half hours later, my back and shoulders throbbing, I stopped and snapped a couple photos of my handiwork (and Margaret's: she helped too) A 12 foot wide path, scooped, hacked and scraped. From the county road, all the way to the house. I paced it off: 135 paces. That's 270 feet; basically the length of a football field, give or take. For the geeks in the audience, that over 3,200 square feet that was rendered flat, pristine and basically snow free. Good enough for a precious propane truck? Time will tell. But I can tell you, I no longer think the house is too close to the road. I can also tell you, I am officially in the market for an ATV with a plow. Lord Almighty. The view from near the county road. 12 feet wide, with a yellow plastic shovel. And, the back half of the driveway, back to the house. I had to prune a couple of the pinons to get a good clear path. The truck you see is the fella installing the carpet on our stairs, crossing off one of the few items remaining on the punch list. Woo hoo! "I never thought I'd hear myself saying this. I'm building a house in Ridgway but right now half the house is in Nebraska or Kansas somewhere. The other half is coming down the highway next week. Hopefully out of the way of severe weather." Landing on a witch would not be much of a consolation prize if the house boxes get scooped up. Fortunately, the next couple days outlook is a bit better than this! we'll keep our fingers crossed, as we finish the last few details of signing our life away on the construction loan, which should close tomorrow. Next week, the great box party! I always knew there would come a time when the scribbles on napkins, the software images, the hypotheticals and possibles would start to become realities. And that time has come! Up on the mesa, Clint has been busy prepping the site for the foundation pour, in between rain storms. Meanwhile in Wayne, Nebraska, the boxes are taking shape in the Heritage Homes factory. Four cubes that fit together to make a house! Top two halves, about 3 weeks into the build. Roof in place, but no shingles. A view inside one of the lower boxes, this one of the wall that holds up the kitchen island. The dining room extends in the background. A week later in the build, a view of one of the bedrooms. Walls painted, doors installed. Siding getting attached, along with trim on the windows. Exciting stuff! Will all the pieces fit together? How will they fare on the arduous journey to the western slope of Colorado? Soon we find out! Clint was nice enough to send along a couple of pics today. "Yes, Dave, I really am working on your foundation!" Obviously there has been some snow between the first picture and the second. You can also see that the basement is not that deep. After conversing with Clint a bit on this, we decided to keep the basement relatively high. This will allow the septic system to drain better, and will position the deck views and loft views that much higher. Lastly, we decided to add a couple grand to our budget and get a door added to the basement on the north side, right next to the deck stairs. We figure this is money well spent to increase the flexibility and utility of the basement space. As Margaret says, who knows, we may fully finish it one day and have it as a air bnb. But with the basement relatively shallow, we won't need any fancy trick with the french drain, walk up steps, etc. You'd never know that just a few short weeks ago there was over two feet of snow on this ground . The universe promptly flipped an atmospheric switch, and 60 degree sunny days came one after the other, leaving the ground bare, dry and delightfully soft. Good for staking. Margaret and Clint measuring off the basement footprint. I think the tree right behind Margaret's head is a goner. This is a pretty interesting part of this whole building process. Our property is an almost 6-acre parcel, and the platted building envelope on the property is over an acre of it. With different views in different directions, meadows over here, clumps of trees over there, where we put our house says some things about our relationship to our land. Guided by a marvelous book entitled "A Pattern Language" by Alexander et. al, a team of architects who years ago set out to define the "rules" that govern good design, we have decided to use one of their "patterns". Which is this: when blessed with a meadow, don't plunk a house in the middle of it. Rather, place it on the forest's edge, with a nice view of the open. Sadly, a few trees will have to go. But in truth the footprint of this house is only about 28 feet by 48 feet, fairly small. I think we have a good placement. The big window wall of the great room will face almost due east, so our days can begin with plenty of glorious sunlight to go with our french roast, and to avoid too much solar gain in the hotter 2nd half of the day. Clint wants to make sure that WE'RE sure about where the house goes, after all you can't exactly move a foundation once it's in place....but we reassure him. No worries, mate, it's a good spot. Neighbors up the mesa, Jim and Linda, chatting with Clint and checking out the build site. Jim and Linda run a wonderful air bnb out of their home in Log Hill Village, up the mesa about 10 minutes, which we stayed at for two nights. On the far right you can see one of the stakes. Margaret used the weekend to reunite with her boyfriend (that's Mt Sneffels). Yes, it was t shirt weather. Late afternoon light on the Log Hill Mesa escarpment, overlooking the Uncompahgre Valley and the Cimarrons. An easy walk from Jim and Linda's place to here. Some Photos to enjoy of this beautiful corner of the world. Margaret and I are down here for this glorious, 60 degree weekend to meet Clint our contractor and stake out the house footprint, and take care of some other details like appliances, flooring, wood stove... More on all that later. In the meantime…. Log Hill Mesa is snow-free after the big dump a couple weeks ago. View from the FairwayPines area towards the Sneffels Range. The escarpment on Log Hill Mesa. A good place to have wings. I have no idea how many houses I've designed in my life. At least in my mind, or on napkins, things like that. Probably, we all have, right? Moats, drawbridges, trees growing in the living room, you name it. Opening your mind to all the possibilities is a lot of fun. And you can bet that as we hatched this plan to move to Ridgway and create a homestead, we've been scratching out house ideas on napkins for a while now. Of course, just because you can make a drawing of an idea, doesn't mean that it's even remotely buildable. We soon realized that if we weren't careful, we'd be designing ourselves into some tight spots and painful reappraisals. Enter Chief Architect. This Texas-based company makes software for budding amateur architects like yours truly, to let our fancy take flight, while they make sure in the background our designs are buildable, practical, would meet applicable codes, etc. At first I balked at the $200 price tag, but in retrospect I can't imagine going through this process any other way. Let's just say, it's nice to live in the computer age! Our house layout will have roughly 2200 sq feet of living space on two floors, and a 600 sq ft deck. Three bedrooms and two and a half baths, plus an extra study, will allow for some comfortable spaces for guests. The main feature of the house will be a cathedral ceiling great room with a woodstove and a two story picture window wall looking towards Cimarron Range and Uncompahgre Peak. A rendering of what the house might look like when done, when seen from the south east. Note the large picture window wall and wrap around porch. And Skillet will have a fenced yard again! A view of what the full homestead might look like. Detached two car garage with full woodworking shop in rear. Fenced off area to right of house includes a small orchard, plenty of free range chicken forage, and a 50 ft long greenhouse. 1st floor of the house plan. A large great room with a glass front wood stove will be the main hangout area. Note the large wrap around deck connected to the front entry porch. 2nd floor of the house plan. Mostly the master suite and an office loft. A small study will have a pullout sleeper sofa. A full basement will include two window wells and a couple additional windows as well. This basement will be unfinished at first, finishing it will be a future "someday" kind of project. To elevate the deck on the main level, this basement will only be sunk into the ground five feet or so. This, dear reader, is fantastic news. What if there's bedrock just a few inches below? This is a distinct possibility out here in high desert country. A short walk to the back of our land, where it backs up to McKenzie Creek Canyon reveals sandstone ledges and rock outcroppings forming a canyon rim. So definitely, there's bedrock under that grass, and pretty close. Enter Clint, our contractor. He's a front range guy himself - after getting his Hydrology degree at Colorado State University up in Fort Collins, he also sought the peace, quiet, beauty and community of western slope living. Now, he's our contractor. I think he was as relieved as we were to hear his news. Digging down several feet in the spot where we want our house, he gets nothing but dirt. The septic field looks similarly clean of obstructions. They say most home building issues come from problems putting the foundation in. We're one important step closer to being happy home owners! ...are we doing? Well, there comes a time in a fella's life (and a gal's too) when a certain "been there, done that" feeling overtakes you as you gaze over suburbia. I could put on my liberal freedom-hater rant shirt and go to town here, but I don't think so. The reality is, suburbia has been very good to me and mine. I have lived on the Front Range of Colorado for 20 years now. It's offered me gorgeous sunsets, friends, shopping and movies a'plenty, and all the coffee shop latte's I could possible stand. It's been a good deal. Maybe it's a kind of mid-life crisis, I don't know. Why do sane people pick up and move to the mountains? It's cold! There's bears! The roads aren't even paved for cryin' out loud! I have visited that small corner of Colorado called Ridgway several times over the past years, each time with that question whispering in the back of my head. For those who don't know, Ridgway is a small town in the SW corner of Colorado. It sits in a flat valley where the Uncompahgre River emerges from the steep, rugged, spectacular San Juan mountains. The elevation is about 7000 feet, the population about 900 full time residents. It contains the only traffic light in Ouray County. It's a metropolis compared to the rest of the county, which is full of farms, ranches, pinon benches, canyons, rugged cliffs, aspen meadows, and dozens of snow covered peaks above tree line. It is a place where large non-human mammals outnumber the humans many times over. It is a place for fresh starts. For us, it's a place to homestead. Our land, situated on top of Log Hill Mesa, 7500 feet elevation. Many Pinon, Ponderosa Juniper, Sage and Oak call this place home. We hope to also someday. And why not? What is the point of wisdom not applied, not used for anything? So Margaret and I have purchased a 6-acre parcel of land on a quiet, dead end county road, in a sunny spot on a mesa above the Uncompahgre and the valley floor. It's not as rustic as you might think: We have electricity and running water right at the lot line. We have neighbors. But we don't have covenants. Or anything obstructing our view of Cimarron Ridge across the valley. The merging of the conveniences of modern living, with a sense of wildness. View east towards the Cimarrons. So, welcome to this blog! 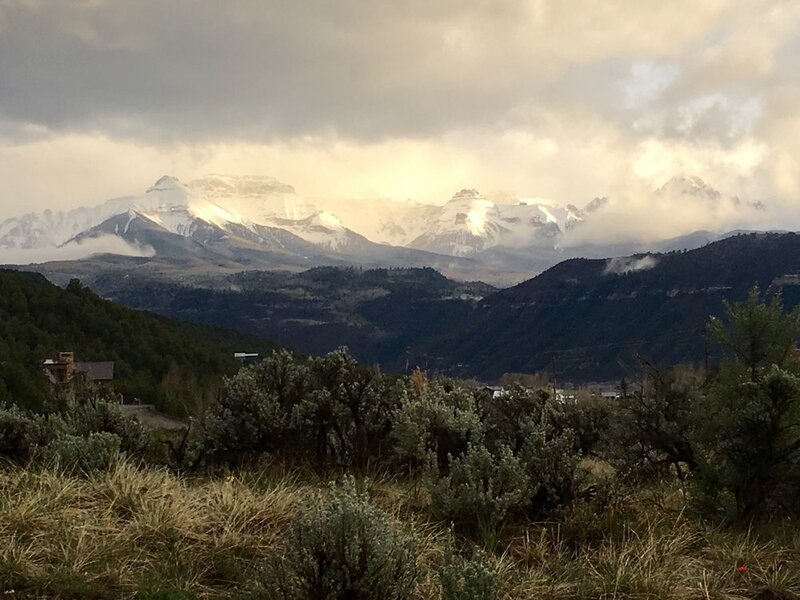 In this blog, I'd like to chronicle our adventure of homesteading and making a new life in Ridgway, from the very beginning. Hopefully we can also share some of what makes this place so incredibly special to us. Thanks for reading!